Son Of Eric is the new band of Bryan Erickson (son of, get it), lead vocalist for the relatively obscure midwest American band Torok (which revolves around Michael Torok, former(?) guitarist for the also generally forgettable horror/schlock speed metal band Impaler). For Erikson, that's not necessarily a load of info you want to include on your curricula vitae. However, it is good to see him come out from under the shadow of it because 'Epiphany' a solid disc of guitar driven melodic hard rock. One listen through 'Epiphany' will tell you that this a minimalist, gritty production. This low budget recording gets the best of Erickson's vocals, normally exceptional by trade, as they sound more off than on throughout. The rhythm section also suffers as the drum sound tinny as $199 set from Wal-Mart, and the bass sounds as if it's submerged in the muddy Missisippi What truly saves 'Epiphany' is the solid song composition and guitar solos. There are some great hard rocking, melodic pieces here like 'The Truth' or the bluesy 'Fierce'. Five guitarist contribute their licks including Torok, Shrapnel artist Todd Duane (outstanding), and Erickson himself on 'Gone.' Actually, the fret work steals the show here placing the band's namesake in the background. Somehow that doesn't seem quite right. 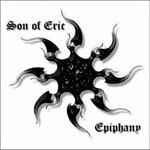 Bryan Erickson's Son Of Eric is off to a promising start with 'Epiphany,' though not quite with the same illumination as it's name implies. Essentially, this is a strong guitar driven melodic hard rock disc where the guitar, and not Erickson, is the star. Overcoming production problems and securing his presence will be Erickson's greatest challenges in the future. Bryan Erickson's Son Of Eric is off to a promising start with 'Epiphany,' though not quite with the same illumination as it's name implies. Essentially, this is a strong guitar driven melodic hard rock disc where the guitar, and not Erickson, is the star.